I went to the Yankee game today and was fortunate to see the Yankees beat the Orioles 4-2. I don't often have the best luck at the games I go to in person so it was fun to see them win today. 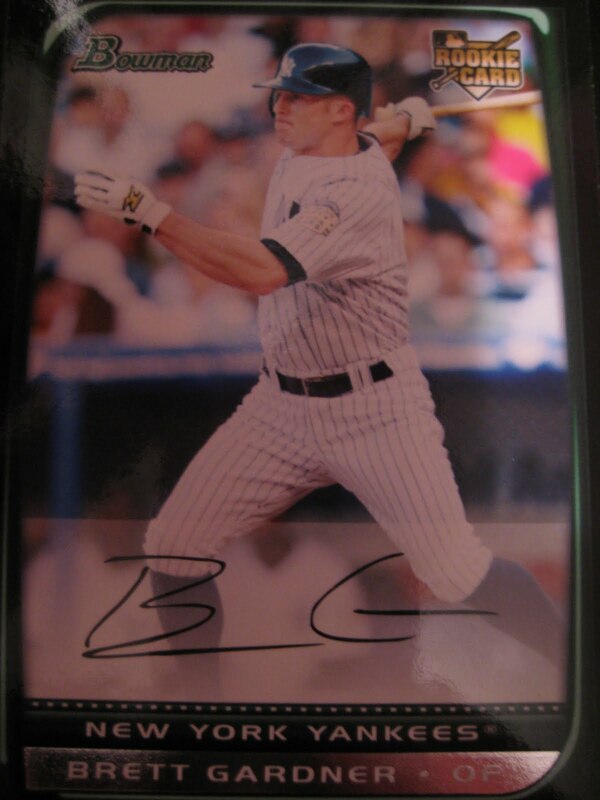 The big highlight was a bases loaded triple by Brett Gardner. One thing I never thought I would see was Francisco Cervelli playing second base. I wouldn't have believed it if I hadn't seen it with my own eyes. He only had one ball hit to him, and it was funny to see him scoop it up very carefully and throw to second very deliberately. I'd love it if Topps made a photo from that play into his 2012 card. I have 22 cards of Luis Alicea. This one is from 1994 Collectors Choice. 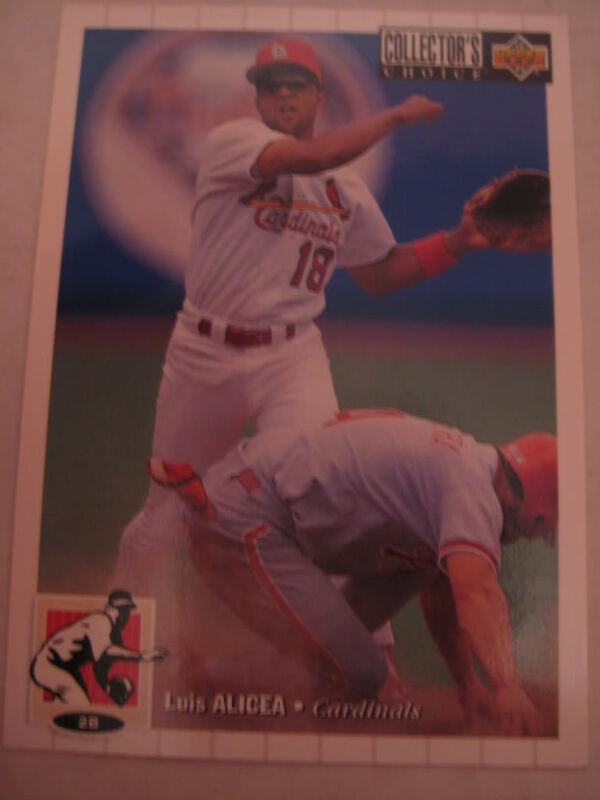 Playing career: Luis Alicea played thirteen seasons in the major leagues, coming up with the Cardinals in 1988, and last playing with the Royals in 2002. The first half of his career saw him play almost exclusively with the Cardinals; the second half of his career saw him bounce around a few American League teams. My memories: I remembered him as being a fairly important Cardinal in the late 80s and early 90s – Ozzie Smith’s double play partner. I was kind of surprised to realize that more than half of his career was spent with other clubs. Where he is now: Coaching for the Palm Beach Reds youth team. Google Autocomplete results: He is first when you type Luis Ali, before Luis Alirio Agudelo Grajales, author of Iconografía Cognitiva de Yoga Universal. Another prominent Luis Alicea is a chiropractor in England. Coming up next: The next profile will be Jeff Alkire. In return he sent me a nice eclectic mix of cards. The most interesting to me was this 2009 O-Pee-Chee, highlighting a pretty random game, a 2-0 Yankee win over Tampa Bay in April of 2008. I don't know much about this set - did they have a card for every game? 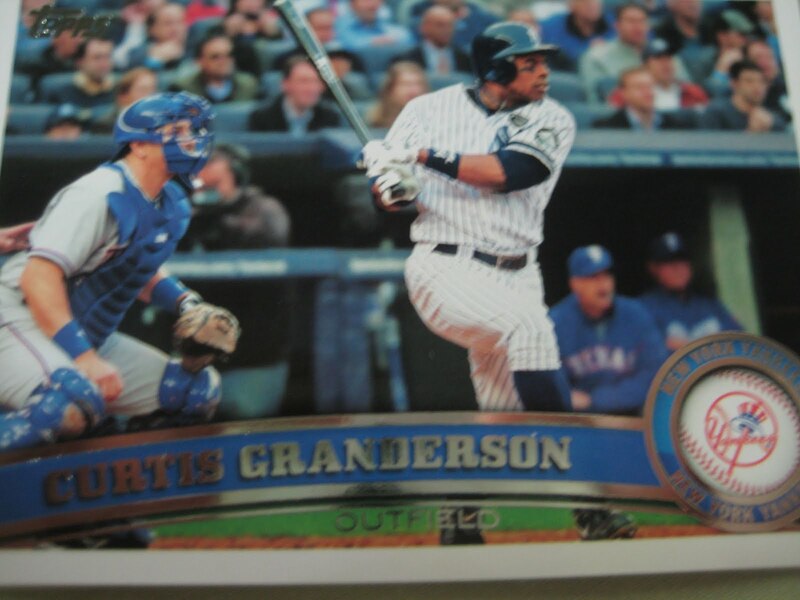 Or is this just an example of a set cramming as much Yankee stuff in as they can to annoy all the Yankee haters? 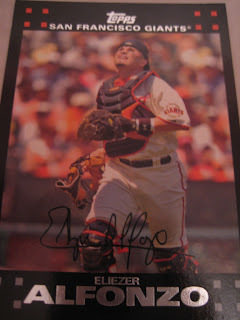 I have one card of Eliezer Alfonzo, from 2007 Topps. 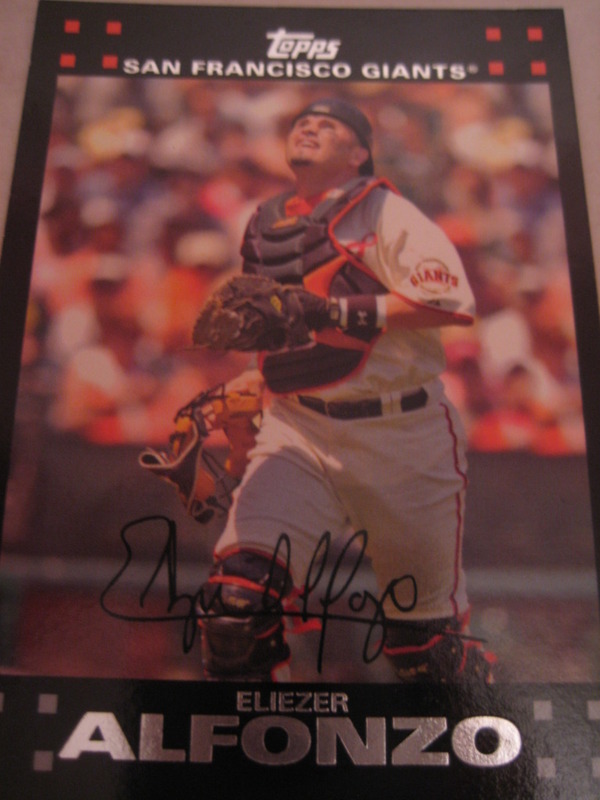 Playing career: Eliezer Alfonzo was a backup catcher for the Giants from 2006-2008. He played briefly with the Padres in 2009 and Mariners in 2010. Where he is now: Now with the Rockies, he made his 2011 debut on July 16, and is 4-17 with a run scored. Yesterday he went 1-4 in a victory against the Dodgers. My memories: The name was vaguely familiar but I hadn’t heard much about him before getting his card. Interesting facts: A second cousin of former Met Edgardo Alfonzo. Google Autocomplete results: He is first when you type Eliezer A, before Eliezer Ayalon, a Holocaust survivor. There do not appear to be any other prominent Eliezer Alfonzos. Coming up next: The next profile will be Luis Alicea. I have eleven cards of Edgardo Alfonzo. This one is from 2001 Upper Deck. 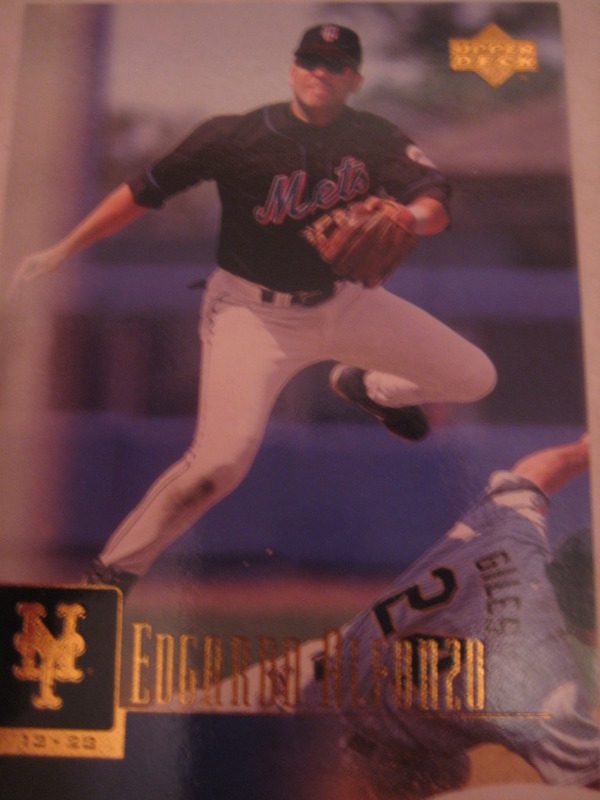 Playing career: Edgardo Alfonzo ranks third on the all time Mets list with 1,136 hits, which says as much about the Mets as it does Alfonzo, who to be fair was an excellent player for the Mets for several seasons, with a knack for the clutch hit. This was especially true in the postseason, where he racked up an .891 OPS in 28 games, over 100 points better than his regular season average. Though best known as a Met, he had a terrific NLDS with the Giants in 2003, going 9-17 with four doubles. My memories: I remember Alfonzo as a fan favorite with the Mets – never heard a bad word about him. It was weird to see him in another uniform in San Francisco. Interesting facts: His older brother Edgar Alfonzo was an Angels minor league player and is now a Mets minor league coach. His second cousin is Rockies catcher Eliezer Alfonzo. Where he is now: He is an Astros minor league coach. Google Autocomplete results: He is first when you type Edgard, ahead of Edgardo Bonilla, a wedding dress designer. There do not appear to be any other prominent Edgardo Alfonzos. Coming up next: the next profile will be Eliezer Alfonzo. I have six cards of Antonio Alfonseca. 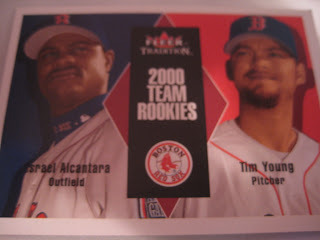 This one is from 2001 Topps. 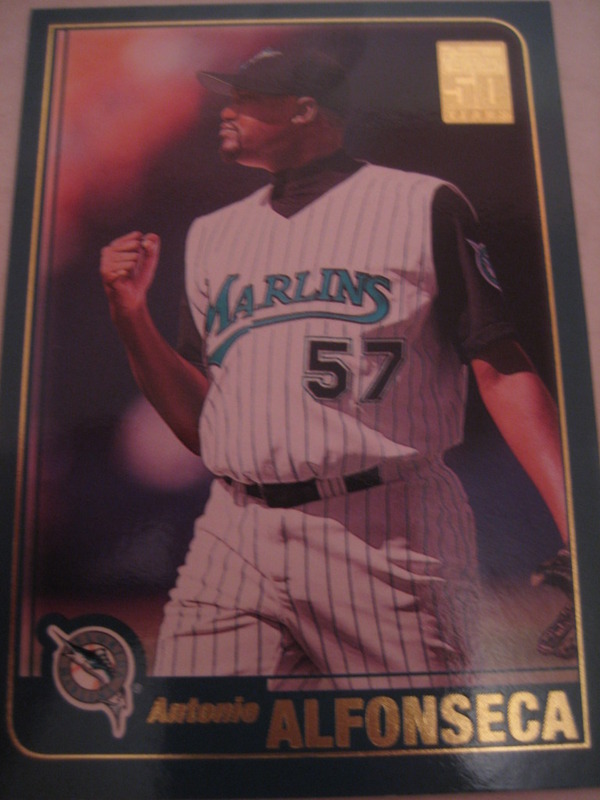 Playing career: Antonio Alfonseca was the Marlins closer from 1999 to 2001, 94 games in that span, including a league-leading 45 in 2000. A herniated disc injury limited his effectiveness in subsequent years. He last pitched in the major leagues for Philadelphia in 2007. 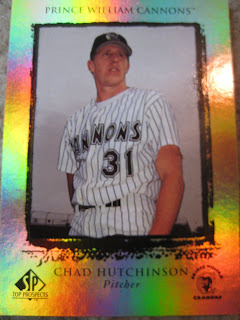 Where he is now: Pitching for the Bridgeport Bluefish of the Atlantic League. In 30 games this season he is 2-2 with a 4.13 ERA. He last pitched on Sunday, in a 5-2 win against Somerset, striking out the only batter he faced to end the eighth inning. Interesting facts: Has six digits on each hand and foot. The extra finger does not affect his pitching as it does not touch the ball when he grips it. My memories: I originally just knew of him as just another National League closer. It wasn’t until later in his career that I heard about the six fingers on each hand tidbit, which certainly made him seem a lot more interesting. Google Autocomplete results: He is third when you type Antonio A, between Antonio Aguilar, a Mexican singer popular in the 1950s and 1960s, and Antonio Anazco, a real estate professional in Washington, DC. There do not appear to be any other prominent Antonio Alfonsecas. Coming up next: The next profile will be Edgardo Alfonzo. I have one card of Flavio Alfaro, from 1985 Topps. 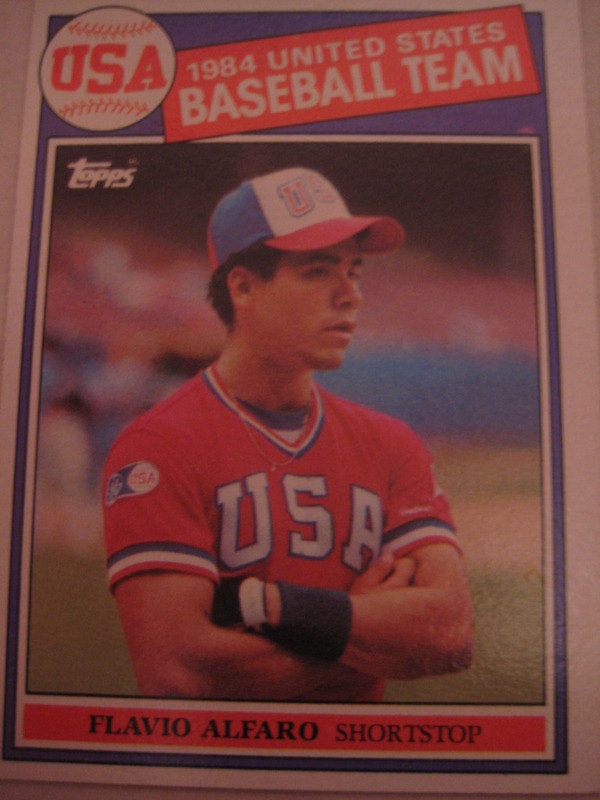 Playing career: A member of the 1984 US Olympic team, Flavio Alfaro played one season for the Braves’ Durham minor league team before retiring due to a back injury. Where he is now: Coaching youth baseball in San Diego. My memories: Just knew him from his 1985 Topps card. Interesting stories: How did he hurt his back? This account, part of a fascinating insight into the behind-the-scenes of a minor league team from the perspective of a then 14-year old team statistician (he’s not afraid to name names!) might give a clue. Google Autocomplete results: He is ninth when you type Flavio Al, between Flavio Albanese, an Italian architect, and Flavio Aloe, a Brazilian neurologist. Flavio Alfaro is also the name of a town in Ecuador. Coming up next: The next profile will be Antonio Alfonseca. 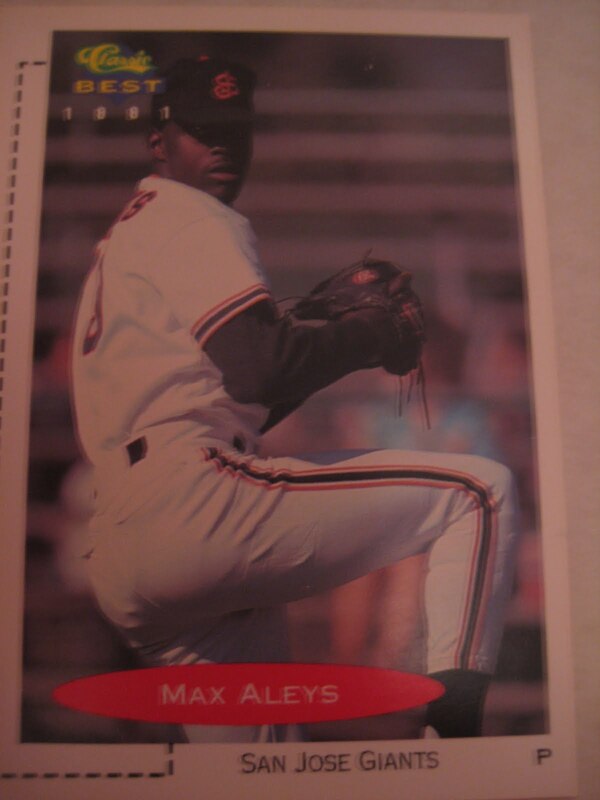 I have one card of Max Aleys, from 1991 Classic Best. Playing career: Max Aleys made his professional debut with the Everett Giants and excelled, going 5-5 with a 3.09 ERA and tossing a no-hitter. Manager Bruce Bochy called him one of the best prospects in the league. He struggled a bit at Clinton in 1990 but was very good at San Jose in 1991, going 5-1 with a 2.28 ERA in 37 games. However, he never pitched professionally in the US again. Where he is now: There is almost nothing about Max Aleys on the internet about his playing days, and nothing about where he has been since. Does anyone know anything about this guy? Interesting stories: Just about the only thing I can find about Aleys was this 1989 article from the Spokane Chronicle, talking about a great game he pitched less than 24 hours after six of his teammates on the Everett Giants were detained (though not arrested) after “the players obtained food by breaking into a concession stand at the Festival of Four Cultures.” The players weren’t named but the article says none of them played that day. Looking at the box score, one of the four future major leagues on that team, Dwayne Hosey, played in the game. Two of the others were starting pitchers, Greg Brummett and Rafael Novoa, so they wouldn’t have been in the game anyway. But regular shortstop and future Yankee Clay Bellinger is noticeably absent from the boxscore. Google Autocomplete results: Neither Max Aleys or Maximo Aleys are searched enough to make the autocomplete. There do not appear to be any other prominent Max Aleyses. Coming up next: The next profile will be Flavio Alfaro. I have three cards of Matt Alexander. 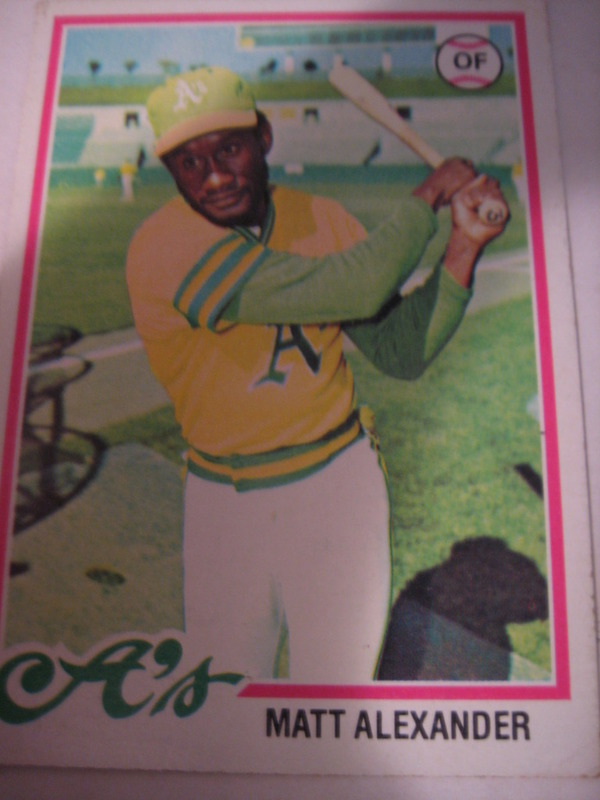 This one is from 1978 Topps. Playing career: Matt Alexander was perhaps the best of the “designated runners” of the 1970s, used primarily as a pinch runner. He played nine seasons in the major leagues, had just 36 hits, but stole 103 bases. Yesterday I mentioned negative OPS+; in 1976 Alexander’s OPS+ was -80, going 1-30 at the plate with no walks. Yet, he stole 20 bases. Three years later, as a part of the World Champion 1979 Pirates, he put together a 228 OPS+, getting seven hits in thirteen at-bats. He was also 13 for 14 on the basepaths. However, in his only World Series appearance he was thrown out trying to steal. Where he is now: Alexander worked at Libbey Glass in Shreveport, LA for fifteen years. He retired in 2008 and now drives a van for the handicapped. He also coaches American Legion ball. My memories: His playing career was before my time. Interesting stories: While in the minors he was drafted and spent two years with the Special Forces. With money from the GI Bill he went to barber school. On the 1979 Pirates he regularly cut the hair and trimmed the beards of teammates like Dave Parker, Bill Madlock and Mike Easler. You can read a detailed interview of Alexander on the SABR website. Google Autocomplete results: He is the first result when you type Matt Ale, before Matt Alexander Wappingers Falls, referring to the mayor of that New York village. Another prominent Matt Alexander is a former senior US interrogator in Iraq who helped find the former leader of Al Qaida in Iraq, Abu Musab Al Zarqawi. Coming up next: The next profile will be Max Aleys. Playing career: Manny Alexander was a defensive whiz at shortstop, groomed by the Orioles in the early 1990s to replace Cal Ripken. Unfortunately, two things happened: Ripken stayed being pretty good for longer than the Orioles anticipated, and Alexander couldn’t hit big league pitching at all. After a 1996 season in which he hit .103 in 78 at bats, putting up a -37 OPS+ (I’m not all that caught up on the newer stats – I didn’t know you could have a negative OPS+ until I read Alexander’s b-ref page) he was traded to the Mets. Only the Mets would trade for a guy with a -37 OPS+. He bounced around for quite a while, and was still in the majors as late as 2005 and 2006, where he hit .111 and .176 for the Padres. 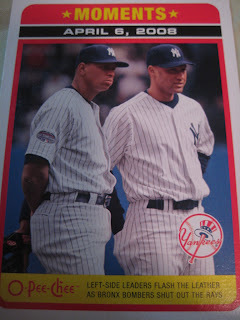 My memories: I remember even the Yankees had Alexander at one point - 2002. They got rid of him in spring training when he was implicated in the incident when Ruben Rivera stole Derek Jeter’s glove. I have nine cards of Manny Alexander. This one is from 1992 Classic Best. Interesting story: Alexander was with the Red Sox in 2000 when he let the batboy borrow his car. The batboy was arrested for driving without a license and steroids were found in the car. The steroids were never definitively linked to Alexander. In a 2005 interview, the batboy, Carlos Cowart, blames Alexander and the Red Sox for his subsequent downward spiral into self-mutilation and other destructive behavior. Hopefully in the six years since then he’s learned to take some responsibility for his own actions. Where he is now: He was playing in Europe as recently as 2009. Don’t know where he is now. Google Autocomplete results: He is sixth when you type Manny Al, between Manny Alia, who played high school basketball in Fort Bend, TX in 2008-2009, and Manny Alas PWC, referring to the New York Metro Forensic Practice Leader at PricewaterhouseCoopers. Another prominent Manny Alexander is a high school football player in Katy, TX. Coming up next: The next profile will be Matt Alexander. Greg Mullins pitched four seasons in the Brewers organization, making the major leagues in 1998. After his playing career, he was a high school coach for many years (he was Tim Tebow's high school baseball coach) and is now the head coach at Brewton-Parker College in Georgia. He kindly answered my questions about baseball cards. 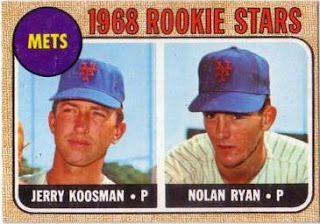 "I do collect cards, my favorite card is of Nolan and Koosman's rookie year. Yes I still have one of myself. I still love to get them in the mail and sign them for people. That tells me that there are moms and dads still teaching and talking about the old guys that used to be there. Keeping some legacies going." Thanks! A card of Mullins can be seen in the upper left in this picture. 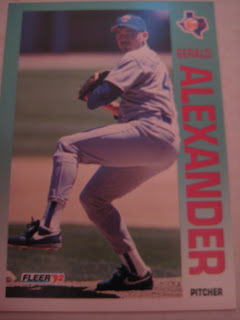 I have seven cards of Gerald Alexander. 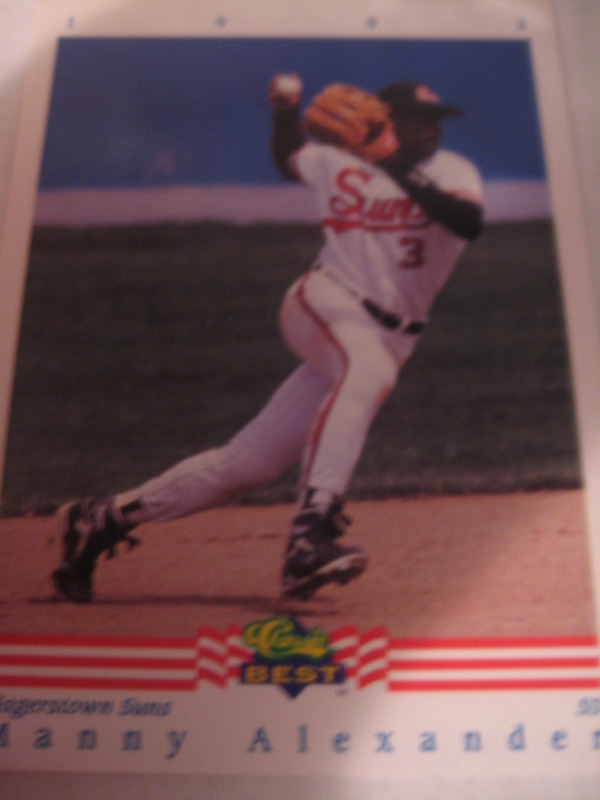 This one is from 1992 Fleer. Playing career: Gerald Alexander pitched for the Rangers from 1990 to 1992. He went 6-3 despite a 5.79 ERA and allowing 170 baserunners in 98 innings. Where he is now: Could not find. Anyone know where he is now? My memories: Just knew him from his 1992 Donruss card. Google Autocomplete results: He is eighth when you type Gerald A, between Gerald and Cullen Rapp, an illustration agency, and Gerald Appel MD, a professor at the Columbia University Department of Medicine. The baseball player is actually sixth on the first page when you google Gerald Alexander; the first five refer to the safety for the Carolina Panthers. Coming up next: The next profile will be Manny Alexander. I have six cards of Gary Alexander. 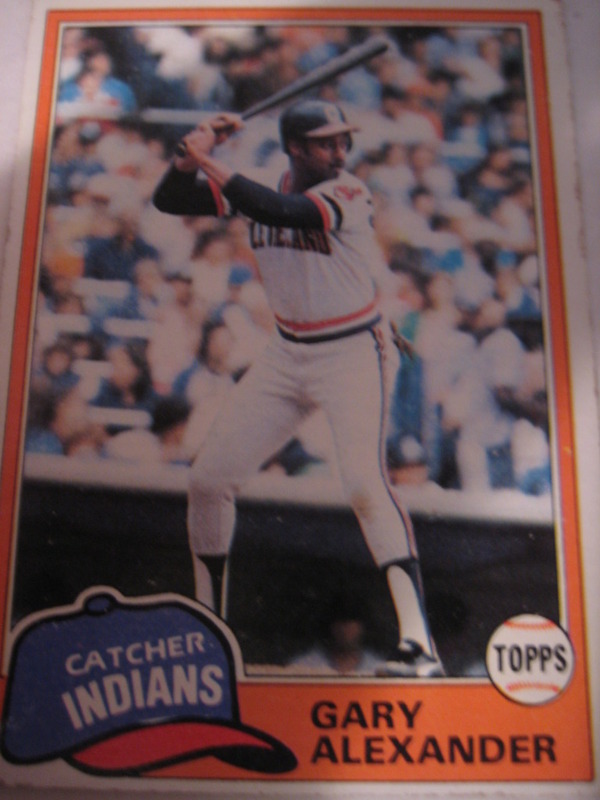 This one is from 1981 Topps. Playing career: Gary Alexander played parts of three seasons for the Giants from 1975 to 1977, catching John Montefusco’s no-hitter in 1976. He was traded twice in three months in 1978 – to the A’s in March, then to Cleveland in June. 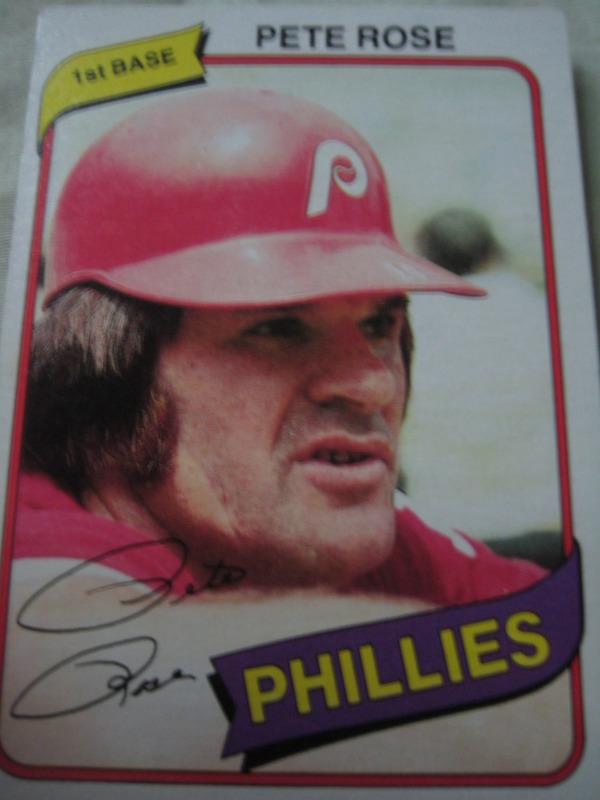 He managed to hit 27 home runs that year but struck out a league leading 166 times. In 1979 he struck out 100 times in 358 at bats, then struck out 52 times in 178 at bats in 1980. He played briefly for Pittsburgh in 1981 and that was it. My memories: His playing career is before my time, but I remember seeing him towards the beginning of the baseball encyclopedia, and being amazed by just how often he struck out. Google Autocomplete results: He is third when you type Gary Ale, between Gary Alexander Karate, referring to the Martial Arts Hall of Famer, and Gary Alex DMD, a dentist in Huntington, NY. The baseball player is actually sixth on the first page when you google Gary Alexander, after pages for the karate champion and a Representative from the state of Washington. Coming up next: The next profile will be Gerald Alexander. Check out my latest installment of This Week in Baseball Cards over at the Hall of Very Good. Topics covered are Kevin Costner, tattoos, and my favorite Yankee Stadium memory. I have 34 cards of Doyle Alexander. 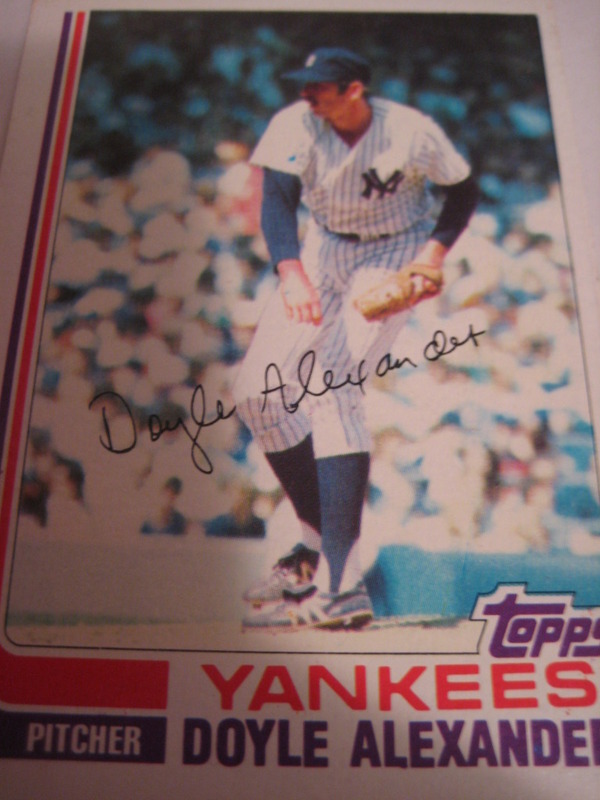 This one is from 1982 Topps Traded. Playing career: Doyle Alexander pitched 19 seasons in the major leagues. He originally came up with the Dodgers, who traded him to Frank Robinson. He then moved on to the Yankees, the Rangers, the Braves, the Giants, the Yankees again, the Blue Jays, and the Braves again, who traded him to the Tigers for minor leaguer John Smoltz in 1987. He went 9-0 in eleven starts for the Tigers, leading them on a late charge to the AL East title. He earned MVP votes in 1984, 1985 and 1987. He retired in 1989 after leading the American League in losses and home runs. Alexander was one of the worst pitchers in postseason history. In six starts he was 0-5 with an 8.38 ERA. Where he is now: For someone who won almost 200 games he has kept a very low profile since retirement. Anyone know where he is now? 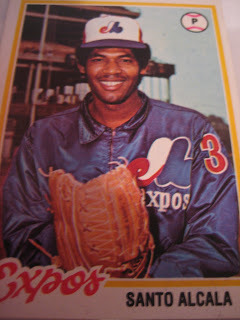 My memories: By the time I was following baseball, he was already an ex-Yankee. Just another former Yankee pitcher who had gone on to greater success with other teams. Google Autocomplete results: He is seventh when you type Doyle A, between Doyle and Dunneys, a bar in New City, NY and Doyle Auction Results, referring to a New York auctioneering company. Another prominent Doyle Alexander is a former Tiger Stadium employee who passed away last year. Coming up next: The next profile will be Gary Alexander. I have four cards of Jay Aldrich. This one is from 1988 Topps. 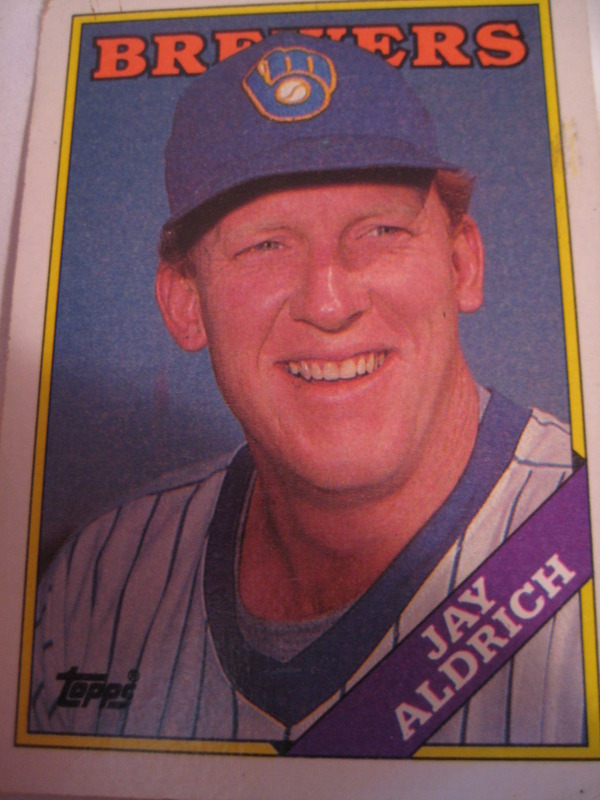 Playing career: Jay Aldrich was a middling middle reliever for Milwaukee, Altanta and Baltimore from 1987 to 1990. In 65 games he was 6-5 with a 4.72 ERA. I suppose a testament to just how ineffective he was is that his Greatest 21 Days profile is all about home runs he gave up. My memories: Just knew him from his 1987 Topps card. Where he is now: I can’t find anything about his post-baseball career. Any of you readers know? Google Autocomplete results: He is third when you type Jay Ald, between Jay Aldous, Chief Strategist at Social Capital Partnerships, and Jay Aldridge, owner of Metro-Maintenance in Texas. Another prominent Jay Aldrich is a photographer in Nevada. Coming up next: The next profile will be Doyle Alexander. 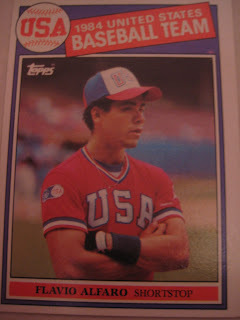 I have 24 cards of Mike Aldrete. This one is from 1989 Fleer. 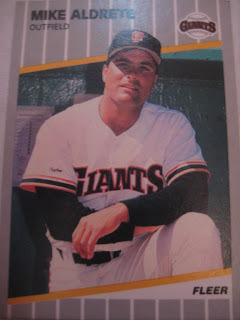 Playing career: Mike Aldrete played ten seasons in the major leagues, starting his career with the 1986 Giants and finishing it with the World Champion 1996 Yankees. A backup first baseman-outfielder, his best season was 1987, when he helped the Giants win the NL West by hitting .325 with 9 HR and 51 RBI in 357 at bats. Where he is now: Assistant hitting coach for the St. Louis Cardinals. My memories: I remember him being the 25th man on the 1996 Yankees. He did very little with the team, but was prominent in a lot of the pictures of the on-field celebration as he was one of the first players jumping out of the dugout after the last out. Any player who was on the first Yankee World Championship team in my memory is special to me, though. Interesting fact: Brother Rich Aldrete played six seasons in the Giants and Cardinals organizations. Google Autocomplete Results: He is second when you type Mike Ald, between Mike Alden, Athletic Director at Missouri University, and Mike Alder, a personal injury attorney in Los Angeles. There do not appear to be any other prominent Mike Aldretes. Coming up next: The next profile will be Jay Aldrich. Here are some of the hundreds of cards I got in my latest trade with Scott Crawford. Lots of shiny stuff, like 1999 SP Top Prospects. Speaking of shiny, there was a bunch of Score Gold Rush, the best of the various 90s parallel sets. He also sent me a bunch of 1980 Topps. I now just need 100 (Bench), 393 (Ozzie), 450 (Brett), 482 (Rickey), 500 (Seaver), 508 (UL Washington), 580 (Ryan), 600 (Reggie), and 689 (Red Sox team) to finish the set. Speaking of finishing sets, I am down to five needs for 1992 Fleer - 6 (Dwight Evans), 182 (Molitor), 237 (Mattingly), 252 (Canseco), and 710 (Ryan ProVisions). I have hundreds of other cards from that set to trade; if anyone wants a starter set for 1992 Fleer let me know. I also have a complete 1991 Score set to trade; and a complete 33-card 1989 Kmart set to trade. The best player on the Yankees right now. 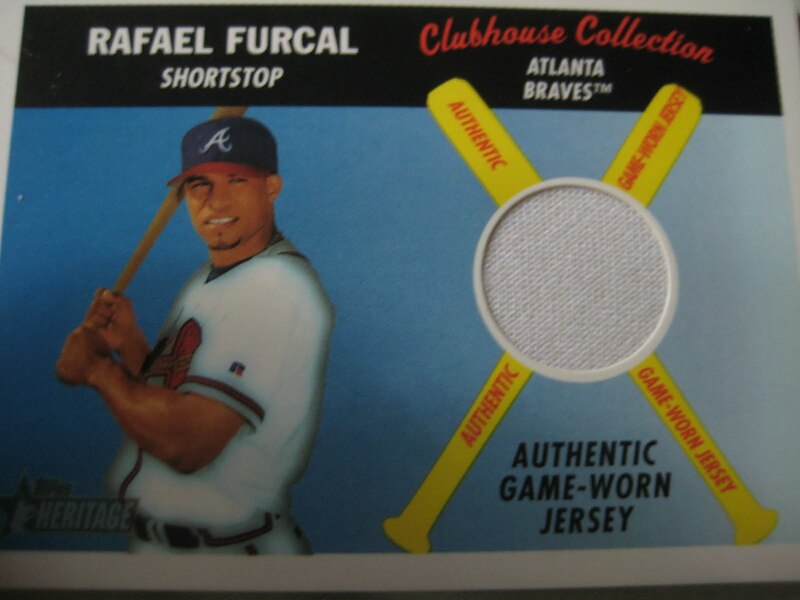 A jersey card of Rafael Furcal. Did you know he turned an unassisted triple play? I didn't until I read the back of the card. I have fifteen cards of Scott Aldred. This one is from 1992 Score. 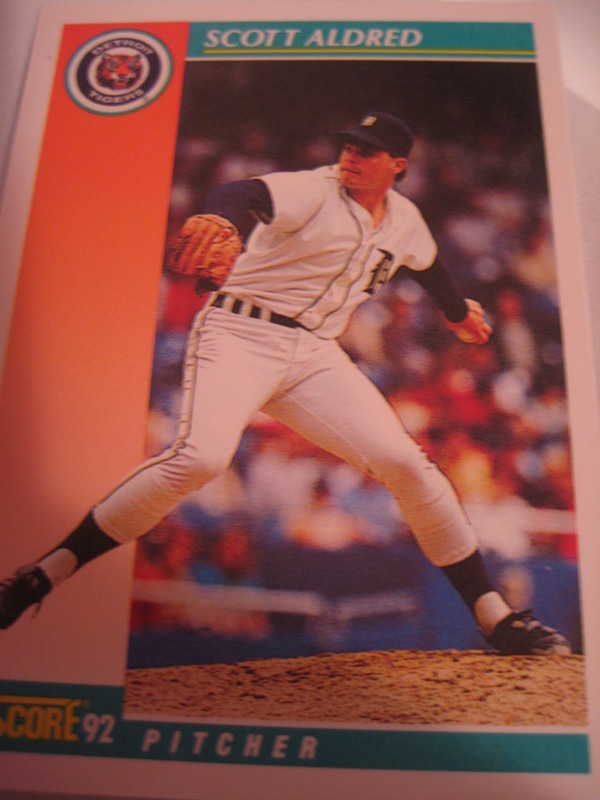 Playing Career: Scott Aldred came up with Detroit in 1990, and 47 games for the Tigers and Expos between 1990 and 1993 before elbow injuries threatened to end his career. He was able to successfully recover, however, returning to the major leagues in 1996 with the Tigers and eventually pitching in another 182 big league games through the 2000 season with Detroit, Minnesota, Tampa Bay and Philadelphia. His career was more quanitity than quality, however – he had a 20-39 record with a 6.02 ERA. You can read a more detailed account of his pitching career at The Greatest 21 Days. Where he is now: Pitching coach for the Scranton Yankees AAA team. My memories: I remember him more as a Tiger in the early 90s, didn’t remember his comeback. This past offseason he was one of the candidates for the Yankees pitching coach job. Google Autocomplete results: He is sixth when you type Scott Ald, between photographer Scott Aldrich and Scott Alder, Co-President of the Michigan Hunter Jumper Association. Another prominent Scott Aldred is the President of NuStar Manufacturing. Coming up next: The next profile will be Mike Aldrete. I have one card of Israel Alcantara, from 2000 Fleer Tradition Update. Playing Career: Israel Alcantara put up good numbers in 51 major league games for Boston and Milwaukee, hitting .270 with 6 HR and 51 RBI. Interesting stories: Most famous for karate kicking a catcher after being hit by a pitch in a minor league game in 2001. Sons of Sam Horn, a Red Sox wiki, has a good writeup about the incident, his Red Sox tenure, and a gif of the kicking incident. More recently, he and several other Dominican former major leaguers (including Felix Jose and Abraham Nunez) had money and passports stolen by a Dominican recruiter promising them jobs in the Netherlands. My memories: I certainly remember that kicking incident, although I had forgotten that it was Alcantara. It’s a shame that’s what he’s remembered for. Where he is now: Coaching baseball in Santo Domingo, Dominican Republic. Google Autocomplete results: Israel Alcantara is ninth when you type Israel Al, between Israel Alert, a daily digest of news on Israel, and Israel Alternative Energy, a reference to renewable energy in Israel. Coming up next: The next profile will be Scott Aldred. Check out my latest installment of "This Week in Baseball Cards" over at The Hall of Very Good. Derek Jeter's amazing Saturday is covered, but so are mid-90s Yankee fans and MC Hammer. I have one card of Santo Alcala, from 1978 Topps. Playing Career: Santo Alcala was a rookie on the World Champion 1976 Reds, going 11-4 in 21 starts. However, he had a 4.70 ERA and had as many walks (67) as strikeouts. He did not pitch in the postseason. 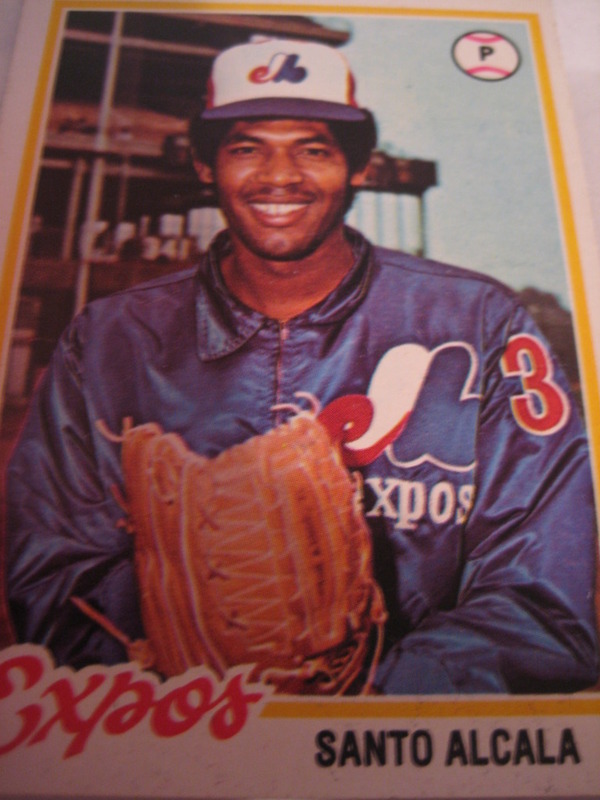 He then pitched briefly for the Reds and Expos in 1977, his last major league season. He hung around the minors until 1982. My memories: I remember him as being one of the pitchers on Mike Flanagan’s rookie card, which was one of many rookie cards pictured in a book I had as a kid called the Hygrade Baseball Card Price Guide. I thought it was funny someone would have a name so similar to Santa. I don’t have any personal memories of him as I was three months old when he last pitched in the major leagues. Where he is now: Coaching baseball in Licey, Dominican Republic. Google Autocomplete results: He is third when you type Santo Al, between Santo Albano, a psychologist in East Setauket, New York, and Santo Alejo, a fifth century Catholic saint. There do not appear to be any other prominent Santo Alcalas. Coming up next: The next profile will be Israel Alcantara. I have one card of Pete Alborano, from 1989 Star. 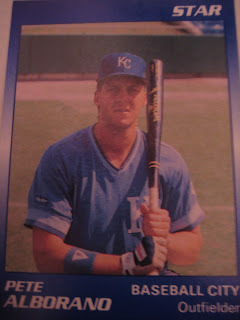 Playing Career: Pete Alborano played seven seasons in the Royals and Phillies organizations. His best year was 1989, when he hit .337 with 6 triples in 77 games for Baseball City. Where he is now: A sheriff in the Nassau County Police Department. 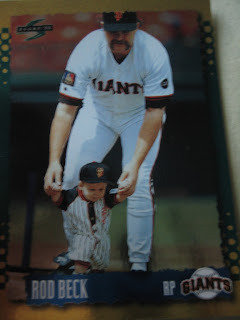 My memories: I was not familiar with him before getting his baseball card. Interesting stories: Earlier this year he shared with me his thoughts on baseball cards. Google Autocomplete results: He is fourth when you type Pete Al, between Pete Alessandra, owner of a paving company in New Jersey, and Peter Alderman, who was killed on 9/11. There do not appear to be any other prominent Pete Alboranos. Coming up next: The next profile will be Santo Alcala.